Hello to all lovers of horses and their beauty. Horsesfascinated me from an early age. I have always been close to the horses, and therefore I couldobserve themin manysituations and details. Horses are a phenomenonof fleeting beauty which I try to capture in my drawings for years. 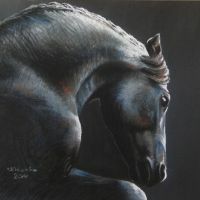 In all the paintings I try to give all the uniqueness, beauty, strength, speed and variety of these beautiful animals. I try them to be watched with a gleam in theireye. At the same time to keep the realism and accuracy in details. My favorite technique is drawing pastels and pencil. I have always drawn with passion and for pleasure, I did not think about competitions. In 2017 I decided to show my paintings to a wider audience and at the Festival of Equine Art in Warsaw on 02.04.2017 my drawing "Piacenza" won the 1st prize in the painting competition. Joy for me is indescribable. 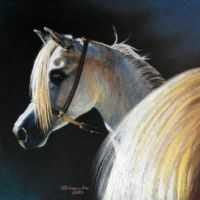 I invite you to my "Gallery of Horses" where can you get to know me through my paintings.